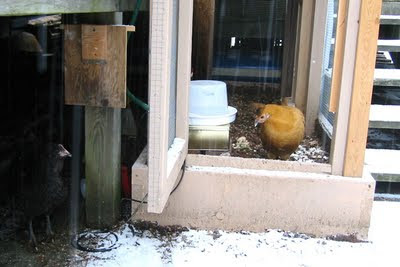 It's our first day of snow this winter and the chickens don't seem to like it so much. In this photo, Fancypants Johnson is trying to figure out how to join up with her friends under the deck without stepping in the snow. For the past two weeks, we've had temperatures below freezing so I had Richard make a heated water dispenser. In the photo you can see the white dispenser sitting on a square cookie tin which has a lightbulb inside. 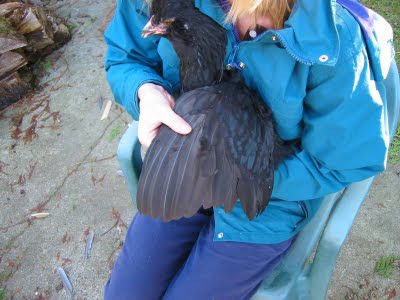 Also this month three of the chickens had their wing feathers clipped. They are now able to fly up as high as the fence, and we can't have them escaping our backyard. Richard clipped each on one side which discourages them from flying since they can't go straight. Only Penguin hasn't been clipped since she doesn't fly much and seems to be lowest in the pecking order. In this picture I'm holding Walter who is about to have three inches cut off her left flight feathers.